"The updated KUHL RENEGADE PANT opposes conventional thought to deliver superior performance, comfort and style. Cut from innovative DURALUX, the durable softshell fabric feels like cotton to the touch. Stronger, more breathable, and boasting superior anti-abrasion and quick dry properties, DURALUX with DWR outperforms standard nylon and provides UPF 50 sun protection. 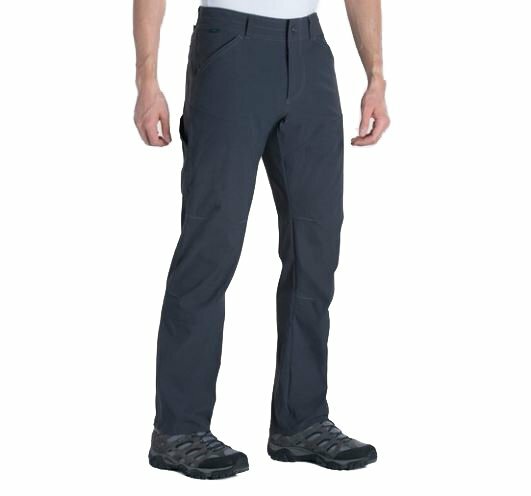 The RENEGADE PANT features our KLASSIK FIT for skiers, bikers, and hikers who need extra room in the pant silhouette for well-developed leg muscles. The waistband is slightly peached for increased wicking performance, faster drying time and unmatched comfort. KUHL articulated knee and gusseted crotch allow true freedom of movement. Eight total pockets, including zippered side pockets, provide abundant storage. Sit easy and worry free with your wallet and phone secured in 3D and drop-in stealth pockets so comfortable you'll forget they're there. Easy care, wash and wear. The RENEGADE PANT features a KLASSIK FIT for skiers, bikers, and hikers who need extra room in the pant silhouette for well-developed leg muscles.